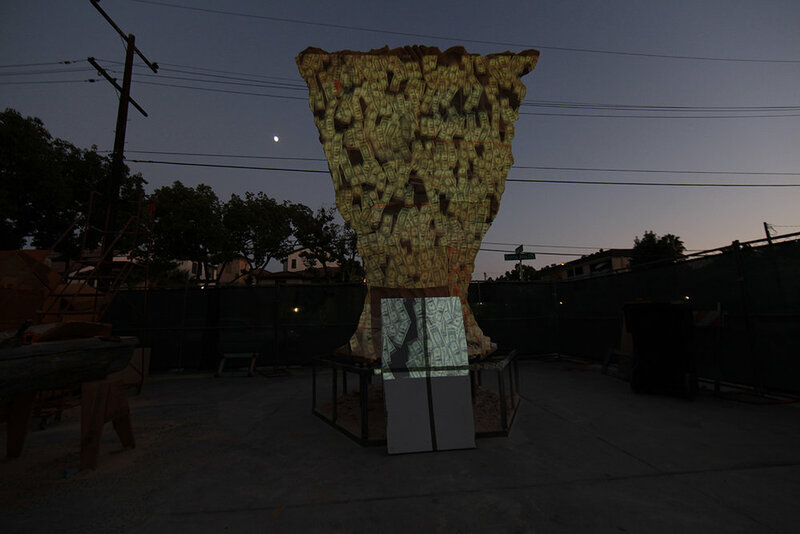 Fountainhead is an interactive sculpture by Charles Long that transforms the public fountain into a mesmerizing interactive monument with the expertise of the creative coding and video design team at Electronic Countermeasures, LLC. Commissioned for the Nasher Sculpture Center’s tenth anniversary Nasher XChange exhibition, the sculpture gives the functions of a modern fountain a digital makeover, replacing water with a flowing field of one dollar bill particles that are projected onto the three faces of the 16 foot tall sculpture standing in Dallas’ NorthPark Center mall. Visitors interact with the sculpture by tossing a virtual coin into the fountain after donating to one of three local Dallas Charities via a custom iOS application also written by Electronic Countermeasures. Each coin tossed into the Fountainhead greets the user with a flying virtual coin that lands on the sculptures surface triggering an exuberant animated splash of money accompanied by a whimsical musical splash from an array of nine speakers. 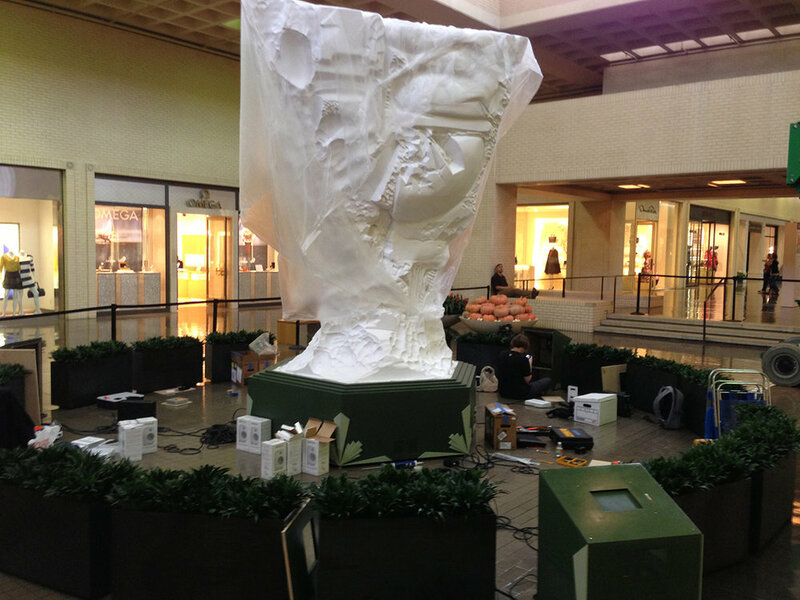 Fountainhead was on display at the Northpark Center in Dallas from Oct 19, 2013 to March 31st, 2014. For his Nasher XChange commission, Long created an interactive, waterless fountain entitled Fountainhead that extends his ongoing investigation into the viewer/ artwork relationship through the use of new technologies. Long’s project is an innovative contribution to the tradition of artist-made fountains. Relying more heavily on technology than anything Long has produced thus far, the installation performs every function of a traditional fountain, only virtually. Projected images of sheets of dollar bills move serenely over the surface of a sculpted, head-like form, flowing like water, instantly adapting to every nook and curve, accompanied by an elegant soundtrack of moving water and paper. It also updates the role of the public fountain as a source of well-wishing and charitable giving. 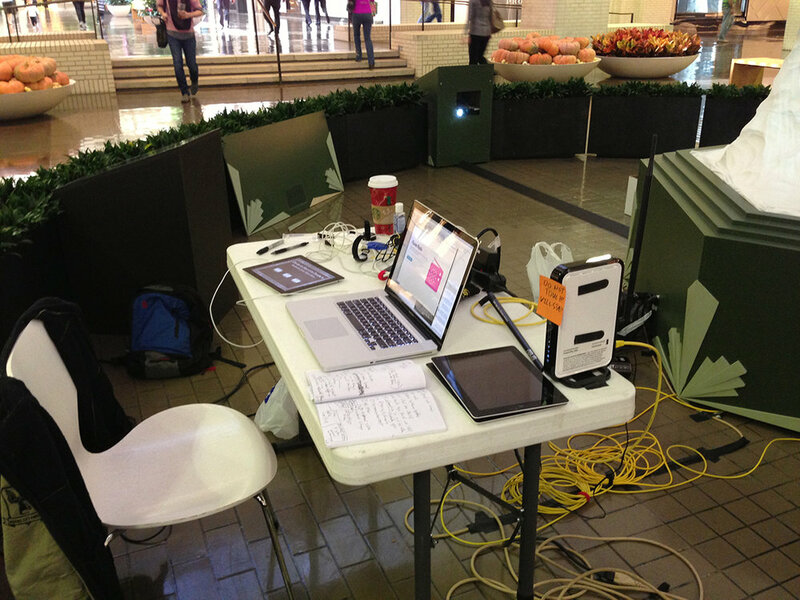 Three kiosks topped with iPads surrounded the form and offered an opportunity for visitors to donate money to one of three Dallas charities: Bookmarks, a branch of the Dallas Public Library; Dallas CASA and the North Texas Food Bank. After payment was tendered, visitors were encouraged to flick a virtual coin on the iPad screen toward the form, resulting in an exuberant splash. Prototyping, material tests, light tests, and system tests were all crucial to bringing Fountainhead to life. Initial projection form tests were done at tabletop scale to get an idea of the distortions across the form and also help determine the best method to go about creating the video component of the piece. The Open Source programming language, Processing, formed the backbone of the animation and control system for the piece. Constantly shifting flow fields direct a system of 1,200 one-dollar bill particles over the contours of each face of the sculptural form creating an ever-changing water-like motion. Processing also handles the audio playback and receives OSC messages sent from the iPad kiosks to trigger splashes when a user makes a donation. The iPad donation kiosk app utilizes the PayAnywhere iOS SDK and credit card swipe hardware for processing payments to the charities. Due to the high ambient light environment of the mall itself the sculpture was spray coated in Screen Goo to increase visibility within the high ambient light environment of the mall. Another constraint was power, we had a single 20 amp circuit and no hang points for projectors. We got clever and used 3 LED/Laser hybrid short throw projectors to get the projectors as close as possible and keep power consumption to a minimum. The piece was a great success and was extended, while also surviving a Texas thunderstorm or ten during the process. Built Using: Processing, Minim, OSC, PayAnywhere iOS SDK and hardware, Cocoa OSC, and XCode.